My local farmers’ market opens for the season this weekend and I am so ready for it. To honor that occasion, here’s a recipe for a classic French sauce to dress up the lovely greens that I’m eagerly anticipating. 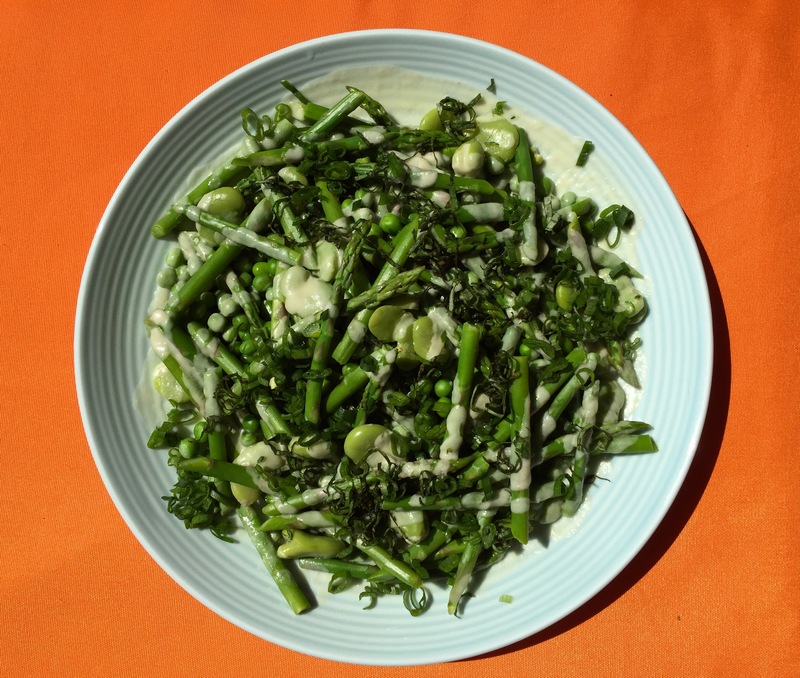 While they may not have these exact greens at the market, anything along the lines of asparagus, peas, and fava beans will work beautifully with this light and lemony beurre blanc, or French white butter sauce. If you know a thing or two about French cooking, then you probably know that beurre blanc can be troublesome to prepare. It’s certainly not something you whip up after work on a weekday. But a few years back when I used to test and edit Jamie Oliver’s recipes for delicious. magazine, I learned a great cheat’s version from him that’s a quick and foolproof way to mimic this grand dame of a sauce. This is my very own version of that awesome cheat. The trickiest step in making beurre blanc is the emulsion stage. That’s when you add the fat (in this case butter) to the water (in this case wine and lemon juice) and whisk them over heat so that they come together. Unfortunately, fat and water don’t like to mix so you have to trick them into doing so by whisking vigorously over just the right degree of heat, adding the fat in just the right amounts. Suffice it to say, it gets a sweat going. Enter, the cheat. The emulsion step in this sauce is performed entirely in a warm screw-top jar. By adding the liquid to the jar hot from the stove, then dropping in the cubed butter and shaking vigorously, you can create the same luscious velvet texture with a tenth of the effort. The resulting sauce is impressive enough to serve at a spring dinner party, while the prep involved is effortless enough to make you want to serve it on any given night. First prepare the beurre blanc sauce: In a small saucepan over medium-high heat, combine the wine, lemon juice, and white and light green parts of the green onion. Boil the mixture down until it has been reduced by one third. Quickly strain the mixture while still hot into a re-sealable jar, discarding the green onion solids. Add the butter, seal the lid, and shake the jar vigorously to melt the butter while the mixture is still hot. If there are still some unmelted chunks of butter after a bit of shaking, use a spoon to break up the rest by stirring vigorously. Add the dark green parts of the green onion and set aside while you prepare your vegetables. On a serving plate, combine all the vegetables and drizzle over the beurre blanc while still hot (if the vegetables are cold, the butter in the sauce will solidify so make sure they are warm and ready to serve). Sprinkle over the basil and season to taste with salt and white pepper. *Always snap off the woody ends of asparagus using your hands. Never cut them off with a knife. Snapping with your hands will cause the spears to break off where the woody section naturally ends. ** Fava beans have a whitish outer layer that is easily peeled after blanching. Simply break the thin outer layer and squeeze out the bright green inner bean. This entry was posted in appetizer, side and tagged asparagus, beurre blanc, butter sauce, fava beans, green vegetables, lemon, peas, side dish, spring vegetables. Bookmark the permalink.